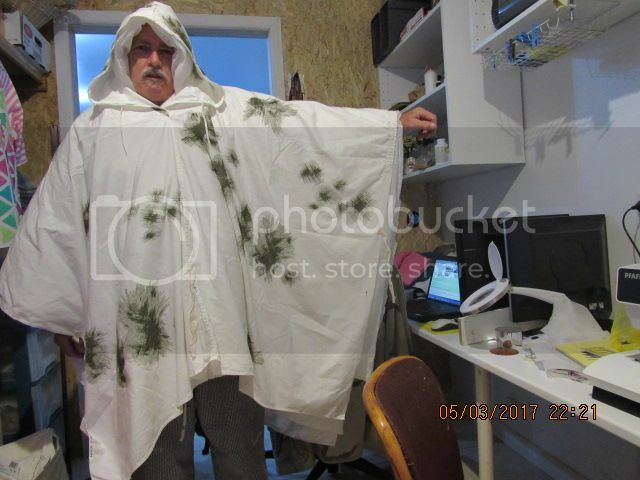 German Army snow camouflage ponchos were very cheap on eBay so I just spent $25- AUD and bought one. Useless As-Is for our conditions but roofing silicon is cheap as is white spirit so when it arrives I'll stretch it out tight [ hot wash first to shrink it of course] and waterproof it. 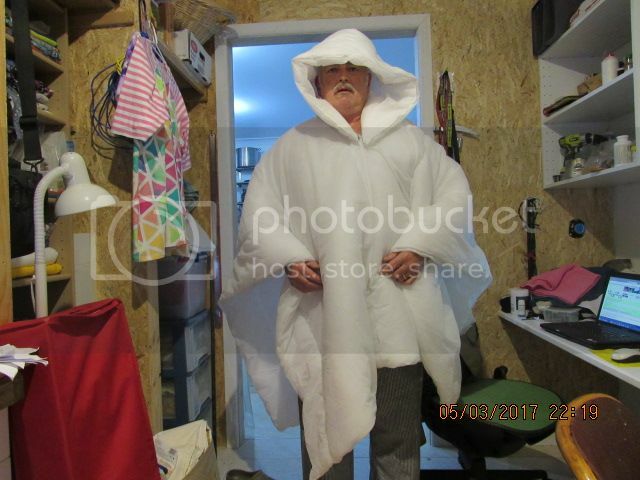 The description on ebay says it is made from breathable, cotton fabric. I do not understand why you would want to waterproof it with silicone, in the process, turning it into a sauna suit? Unless you are planning on trimming it up, it looks far too long in the back to be really functional. Siliconing does make it highly water resistant but not totally waterproof, but I'm in Wet-Cold area and making sure you stay dry [ drier anyway] is more important than breathability here, my main reason for using this is because the proofed nylon ones tend to melt when working around an open fire and using this will keep the wind off the LW breathable insulation underneath. With plenty of space between the inner and outer and with all the venting via the hood opening I doubt I will have any condensation worries, I get very few when using my waterproof Swiss or my Dutch army poncho. Midway USA has them for $9.99 USD, not sure how much shipping would be. After this weekend with the weather changing from 40f to 20f with freezing rain I am definitely going to have some kind of overcover to shed the freezing rain and wind when setting around the fire. The hot tent is a great refuge when you have to dry out, but I enjoy the group campfire. I believe I have 2 of the German army winter camo covers somewhere, gotta find them. I use about 10 % silicon in solvent, it is important to get the most flexible silicon compound tho, even if it is more expensive to start with.